Detecting mountain goats in their Southeast Alaskan habitat is the topic of the next Evening at Egan Lecture: Remote Sensing of Mountain Goats in Southeast Alaska. Mark Riley, Remote Sensing Specialist with the US Forest Service, will share results of a joint study with the Alaska Department of Fish and Game on locating mountain goats with infrared and digital aerial imagery on Friday, Sept. 19, 7 p.m. in the Egan Lecture Hall, University of Alaska Southeast. Mark Riley is the Remote Sensing Specialist for the US Forest Service, Alaska Region and an adjunct faculty at the University of Alaska Southeast. He supports the remote sensing program for the Chugach and Tongass National Forests. In a joint effort with state wildlife biologists, Riley embarked on a project to locate goats in their steep habitat with digital cameras and thermal infrared to detect heat signatures from goats. The goal is to “create a visual record of the goats and their habitat,” according to Riley. The data may be used for a report on potential impacts of recreational activities such as heliskiing, recreational hiking, and hunting guiding on mountain goats. Researchers used a high end digital camera modified to trigger at certain time intervals. It was mounted on a small aircraft along with a thermal sensor that picks up the heat from the bodies of mountain goats. 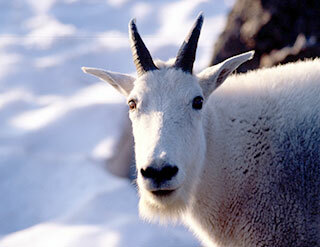 The study concludes that the digital camera is more reliable than the heat sensor to detect goats in their habitat. “The results of the study were enough to encourage further work,” said Riley. For example, mountain goats are so well insulated that in snowy conditions, they blend with the landscape to create conditions known as thermal contrast and thermal loading. “This shows they are well designed for this climate from a remote sensing perspective,” said Riley. The Evening at Egan lecture series is held every Friday at 7 p.m. through November 21, 2008. The Sept. 26 lecture is “Renaissance Utopian Thinking and Genocide: Why is it still Relevant? by Nina Chordas, Assistant Prof. of English, UAS. Visit the Evening at Egan Website for all scheduled lectures.